Happy Hundredth, Metro de Madrid! Well, sort of. Construction started in 1917, but the actual opening was two years later. Getting the subway project started wasn’t easy. King Alfonso XIII (great grandfather of current King Felipe) added a million pesetas of his own fortune to the kitty to get things going – and cut the ribbon on the first 3.5 kilometers of Line 1 in 1919. It was a revolution: Sol – Cuatro Caminos in under ten minutes, instead of at least thirty minutes by tram. Line 1 was lengthened to Atocha almost immediately, and Line 2 (Sol – Ventas) followed shortly thereafter. Of course the original subway was different: only four cars per train, train doors that opened by hand and fares that varied by distance travelled. 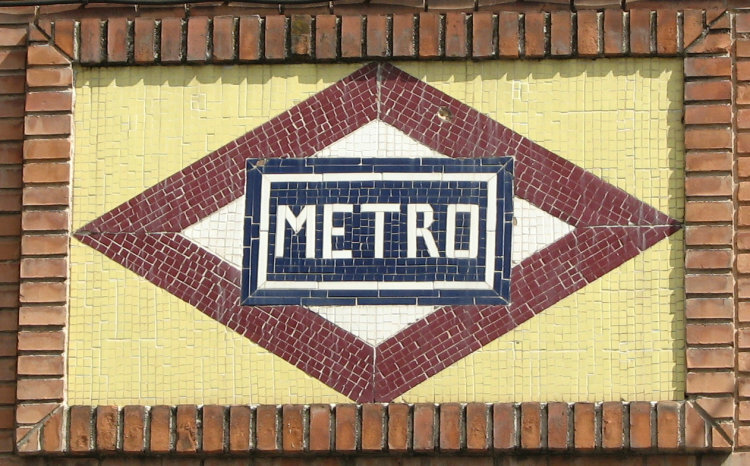 Not to mention the stylish tile decoration in the stations, created by Antonio Palacios to help travellers over the claustrophobia of underground travel (this architect also designed Madrid’s Central Post Office, Bellas Artes and Maudes hospital). Except for a few slow periods, the subway has continued to grow since those first kilometers. Since the 1980’s the growth has been constant – record-breaking in the late 1990’s – up to current track length of about 294 kilometers and 13 lines, second only to more populous London here in western Europe. Veteran Line 1 isn’t the longest of Madrid’s subway lines, but it links train and bus stations, shopping areas, cinemas, restaurants, well-known sights and some fun lesser-known sights, so it has one of the highest user rates of all the lines: over 100 million people / year. Read on to learn how the central part of line 1 can help you explore Madrid. Chamartin, history: Originally a village north of Madrid where the wealthy “got away from Madrid”; village annexed by Madrid in 1948. Today: Train station for long distance and commuter lines. Plaza Castilla, today: Underground commuter bus station for many points north, many city bus lines at stops on the surface; “leaning towers” just north of the roundabout-square. Estrecho, today: Fun, almost unknown museum at calle La Coruña 18: Museo Tiflológico. Run by the Spanish Blind organization ONCE, this little gem has models of monuments from Spain and other countries, and an amazing section of artwork by the blind. Cuatro Caminos, history: Ever wonder about the name of this square? The “four streets” are Santa Engracia, Bravo Murillo, Reina Victoria and Artistas, as Raimundo Fernández Villaverde was created after square was named. Today: important metro transfer – with endless escalators for line 6. Maravillas market on Bravo Murillo is one of the city’s best. Rios Rosas, today: Old Canal de Isabel II water deposit (brick tower built 1865-1876) is an exhibit venue, worth visiting just to see how the space is used. Don’t miss the very top floor. Geology fans: Geominero museum at Rios Rosas 23 – exterior of the building is gorgeous. Iglesia, history: Original name of this station: Martinez Campos. Today: Sorolla museum at General Martinez Campos 37. Excellent pastry shops near this stop! Chamberi, history: Chamberí station was closed in 1966; after that, this “ghost station” was barely visible in the tunnel between Iglesia and Bilbao. Today: Now a mini-museum, with original decoration and advertising posters in ceramic tile. Guided visit (free, in Spanish), video and station visit with trains whizzing by behind a glass partition. Fun even without great Spanish. Access: glass structure on corner of Santa Engracia / Luchana. Open Thursday to Sunday, get current schedules by searching Metro Madrid Anden 0. Bilbao, history: Site of one of the gates in the last line of city walls, called the “Snow Pit Gate” for the pre-refrigerator ice houses nearthe square. Today: best access for eating and drinking around Dos de Mayo, nearby cinemas, and one end of fashion street Fuencarral (other end is Gran Via). Tribunal, history: San Fernando hospital was built to attend 3,000 patients and functioned until 1922; gave the subway stop its original name of Hospicio. The building is a Madrid history museum since 1929. Today: Interesting museum with good permanent collection and temporary exhibits (don’t miss the model of Madrid). Gran Via, history: This emblematic street is fairly new, built 1910 – 1931. Subway stop Gran Via (original name Red San Luis) is right next to Madrid’s first skyscraper: Telefónica building on corner of Gran Vía / Fuencarral, completed in 1929. Today: The Telefónica building has excellent temporary exhibits, and a telecommunications. Gran Via is another shopper’s street – but watch out for pickpockets. Sol, history: Although outside the medieval city, Sol has long been the bustling center for traffic, pedestrians, “Kilometer 0” for Spain’s radial highways, and the first major transfer point for the subway (lines 1,2,3). Remodelled and reorganized more than once over the centuries; site of all kinds of historic events. Today: Pedestrian shopping area on Carmen, Preciados and Monter north to Callao and west on Arenal to Opera. Best subway access for Plaza Mayor and for Real Academia de Bellas Artes de San Fernando (Alcala 13), also for Santa Ana tapa area and movies in English at Yelmo Ideal Cineplex. Tirso de Molina, history: Original name Progreso (old name for Tirso de Molina square); the name of square and metro stop changed in 1939, shortly after dictator Francisco Franco’s victory in the Civil War. Madrid lore has two ghost stories for this station: one story claims that the bones of monks who lived in the convent that used to be in this square are under the subway platforms, placed there by the workers who built the station (and the other ghost story is too creepy to tell here). Today: The recent renovation of this square created a pleasant space with outdoor cafés and a flower market. Access to the Rastro flea market. Anton Martin, today: One of Madrid’s first movie theaters (Cine Doré, Santa Isabel 3) is now the “Filmoteca”, running several sessions of different movies every day. Great prices and even cheaper with their ten-punch deal. Rooftop movies in the summer. A must-do for movie fans! Atocha, history: The old part of Atocha train station was inaugurated in 1892, serving as a station for about 100 years until the new station took over. Today The old station is a greenhouse – a good place to relax before traveling or after a visit to the nearby art museums. New train station for long distance (including AVE) and commuter lines. NOTE: Direct-access metro stop Atocha RENFE better for the station, as old Atocha stop is across many lanes of traffic. Near Atocha / Atocha RENFE: Art museums Reina Sofia, Prado, Thyssen. Anthropology museum, Botanical Gardens, Cuesta Moyana bookstalls, Retiro Park. Pacifico, history: Opened in the early 1920’s on the edge of the city. The “Nave de Motores” generating station, created to guarantee electricity for the subway via a combination of huge engines and transforming power from electrical companies is nearby. Today: The electrical station is newly open as a mini-museum (see Chamberi). Pacifico is an important metro transfer, one stop from Mendez Alvaro (South Bus Station/commuter train station).